The report hits out at HS2's London centric focus, and claims that it will only serve to reinforce existing regional imbalances when compared to the capital. Is suggests that the rail service would 'widen the North/South divide'. In recent months, there has been growing speculation that the scheme could be scrapped, or limited between London and Birmingham. 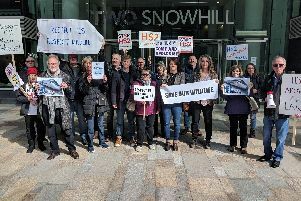 Local Councillor for Buckingham, Warren Whyte, said: "“The business case for HS2 has always been less than convincing and I continue to campaign against this white elephant. "Without any hint of a stop mid-way, there is absolutely no benefit to Buckinghamshire at all. "It will be used by the wealthiest travellers, intensify the north-south investment divide and is a standalone project that simply does not integrate well enough into the existing network. It’s an expensive answer in search of a question." Estimates for building the line have increased by two-thirds since 2011 after taking account of inflation, from £33.3bn to £55.8bn. The report concluded that the £56bn budget would be better spent on upgrading the rest of the rail network and small-scale local projects as part of a comprehensive rail strategy. -Full electrification of much of the northern rail network. -The reopening of the trans-Pennine Woodhead line between Manchester and Sheffield to provide a fourth east-west link in the north. -A Bradford Crossrail to link the two lines that terminate in the city and put it at the centre of northern rail. -The full electrification of the Midland and Great Western lines. -The creation of more four-track sections on the three core, north-south mainlines and the building of bridges to take slower, regional lines over intercity tracks to speed up long distance journeys. “Whilst some proponents pretend that construction has already started on HS2, it has still not received notice to proceed from Government. “HS2 Ltd are massively behind schedule and there are no designs, no contractors and no costings for the proposed work at Steeple Claydon. “It’s not true to say HS2 won’t benefit the Midlands and the North. HS2 will service 25 stations from Scotland to the South East, representing around half of the UK population. "All along the route local economic plans are being developed that ensure the whole country will benefit.